Since the 1842 split of opera from ballet with the production of Giselle, audiences have observed a multi-faceted and successful revolution in the staging, design and aesthetics of story dance. In terms of the persistent theme of heterosexual politics, however, opera and dance continue to validate obvious and cumbersome stereotypes. In the 19th century, audiences attended the opera house in order to see two types of works, opera and ballet, which were not yet fundamentally different from one another. Even then, however, opera often dealt with political themes and historical events, while in ballet, the esprit du temps was merely a backdrop for lovers, not central or thematic. There is no doubt choreographers deliberately displayed the sexual aspects of the dancers in order to fill houses – a practice that tainted ballet in the 19th century with an atmosphere of promiscuity. It is in this era of opera history that we find ballet’s first steps toward true independence, and Giselle is a revealing example of the depth of this change. None of this is to say that operatic sensibilities did not cling to ballet choreography in the 20th century. In general, however, the apparent severing of ballet from opera is the consequence of an attitude that gained increasing popularity in the 20th century. It is the idea that functionless, program-less musical structure is not only legitimate as content, but also the only really worthy content. Given the settled temper of the current, so-called abstract aesthetic in dance movement, it is intriguing to see that audiences remain passionate about blatantly sexist story ballets. That the sensibilities of the past can co-exist in many productions with the current conceptual aesthetic shows that we are at once close to the past and far away from it, and that audiences take the dual nature of our point of view for granted. Since the 1842 split of opera from ballet with the production of Giselle, audiences have observed a multi-faceted and successful revolution in the staging, design and aesthetics of story dance. In terms of the persistent theme of heterosexual politics, however, opera and dance continue to validate obvious and cumbersome stereotypes. That this facility should be the norm is dependent on a single reality: People attended the opera house in order to see two types of works, opera and ballet, that were not yet fundamentally different from one another. They looked enough alike and were structured similarly enough that comprehension of the two forms did not require separate competencies or knowledge of two vocabularies. Historically, there have been two recognized types of ballet music. Symphonie accompanies action, and varies in tone and tempo according to the emotions and gestures performed on stage. Airs are intended specifically for dancing and contain 8-bar measures, written in a single key and following a set tempo. They are similar to the cavatinas, duos, and trios one finds placed between the recitatives in opera. In the 18th and 19th centuries, airs parlants, which make up the symphonie, in part, were frequently lifted from popular productions and therefore brought specific words to mind and associated recurring motifs with particular characters. Opera often dealt with political themes and historical events, while in ballet, the esprit du temps was merely a backdrop for lovers, not central or thematic. In opera, death is gruesomely public, socially significant. In ballet, death is frequently the result of a failed love affair. The most popular subjects for ballet-pantomimes were dance itself – balls, dance lessons, ballet class, or the fantastic – like Giselle – for fantastic characters might naturally be expected to move in a balletic manner. In the 1830s and 40s, all operas contained at least one long ballet divertissement, which followed the formula of entrance, adagio, variations, and coda, and was part of the story rather than a diversion during changements a vue. It is in this era of opera history that we find ballet’s first steps toward true independence, and Giselle is a revealing example of the depth of this change. Originally consisting of 54 minutes of mime and 60 of dancing, from its first performance in 1842, Giselle was always performed on the same program as an opera. Dance scholar Marian Smith presents the evidence of an unpublished repetiteur, annotated line by line with a detailed description of the gestures of the pantomime players, showing that subtleties of story were conveyed with music, music that has since been dropped or whose original purpose is now ignored. With the removal of these melodies and phrases, crucial elements of the tale are also lost: conflict, motivation, suspense, and depth of characterization, tension, and satisfaction in resolution. The parlant music intended to convey conversation and shifting moods, in 20th century productions became merely background, “musical wallpaper”5. For example, in the original pas de deux, Myrtha urges Giselle to dance Albrecht to death. Contemporary choreography presents this sequence as a grand pas in the manner of Tchaikovsky – a set piece, not part of the plot. Again, in Act I, 20th century shortened soliloquies and cuts in the original pantomime scenes serve to remove the idea that both Albrecht and Giselle are headstrong rather than romantic youths, acting against advice. 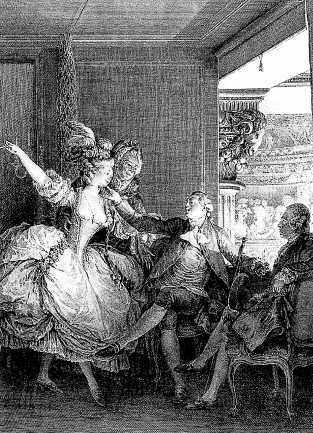 Furthermore, the original Act II had 24 non-dancing roles: aristocrats, peasants and hunters. Deletion of these characters has erased voices, scaled-down dialogues and severed the connections between Acts I and II by removing from Act II the evocations of the mortal world. Robbed of nuances of personality, the characters’ motivations become less tenable, and the viewer’s understanding of causality is lost. As such, Giselle is a turning point ballet. In its associations with opera and its various incarnations it obliterated the divisions between gestures and dance steps, recitative and aria. As a blossoming ballet blanc, concerned with geometric relations before story, and dance for its own sake, it functioned as a prelude to ballet’s burgeoning independence as an art form in the 20th century. The final effect of the new technology was the opportunity it afforded of bringing music to a broader audience. Joseph Horowitz says that recordings have made the enjoyment of music, what was once a largely an exclusive art form “a democratic privilege”7. Recordings have also had a tremendous effect on the practice of choreography. Working with a composition that already exists affords the choreographer the opportunity to study it, to get to know its nuances well, and come to understand its form in detail. Adopting existing music not necessarily composed for dance or attached to story has further allowed choreographers to break away from mime-centered movement. Although exceptions to the generality are famous, George Balanchine nearly always used existing scores. His well-documented collaboration with Igor Stravinsky (1882 – 1971), who shared with him a musical aesthetic that was formed and informed by post-war ferment, gave rise to the neoclassic school of thought that seemed to exclude the old operatic associations between ballet and opera. For Stravinsky, neo-classicism was the “triumph of studied conception over vagueness, of the rule of the arbitrary, order over the haphazard”8. For Balanchine, rhythm, the ordering of time, supplants character and story, and Stravinsky was “an architect of time…[L]ife goes on within each silence” and each fermata is “always counted out in beats.” The rubato (elongation or quickening of the pulse) is “notated precisely, in uneven measures”9. In visualizing these tempos, Balanchine makes relations between units of varying proportions and dynamics articulate. By adding repetitions in the music, and choreographing recapitulation, sometimes faster, slower, on a smaller scale, or tongue-in-cheek, he achieves meaning. A piece like Symphonie Concertante, for example, is a lesson to the audience in how to listen to and to watch ballet – through strict visualization, one instrument, violin and viola, per dancer10. In Concerto Barocco, Balanchine offers the full body of the choreography in the introduction, and then breaks it down into individual ideas that appear separately and in new contexts. By Miriam C. Jacobs in ESSAYS/ SCHOLARSHIP on February 2, 2013 .